Foyle notes a barrage balloon during his visit to London in The Funk Hole. Foyle, the master of brevity, knows when he’s said enough to bring the guilty party to his knees. 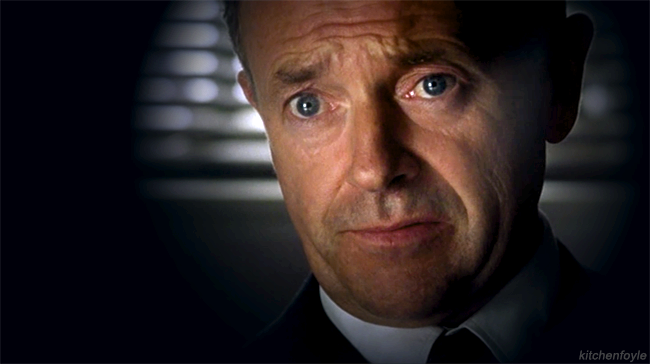 And Michael Kitchen knows how to use his incomparable mouth shrug and eyes to maximum effect. “Fowler. Not Foyle.” “A deliberate foul-up?” Foyle wonders. Forgot how much I love The Funk Hole. Foyle asks Sam to take Andrew out to help in his convalescence. Having managed to extract a dinner invitation from her boss in S1, Sam is on familiar enough terms with him by S2 that she can now joke about him asking her out. This was the first episode I ever saw. 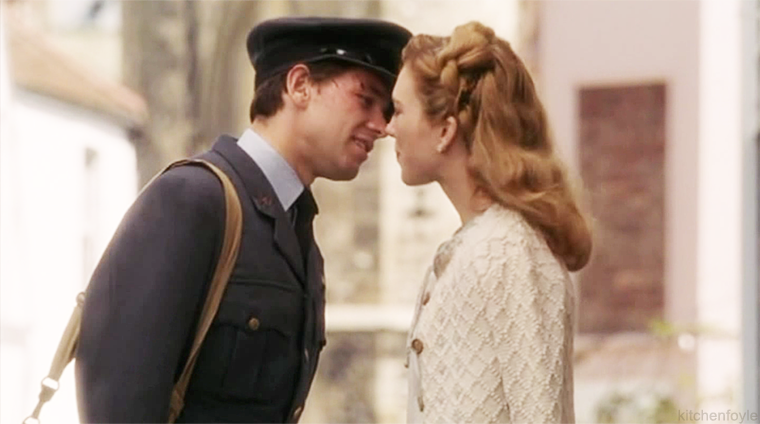 Have been shipping them ever since. Love this scene! Just finished reading Hostage, which takes as its premise the continued courtship of Andrew and Sam 6 months after this tender kiss. The author does a superb job of incorporating all four main characters of Foyle’s War into her wonderfully written thrill ride of a story. Thanks for sending me the link, abjectadmirer. Collier’s baseless accusations and Rose’s incompetence infuriate Foyle. 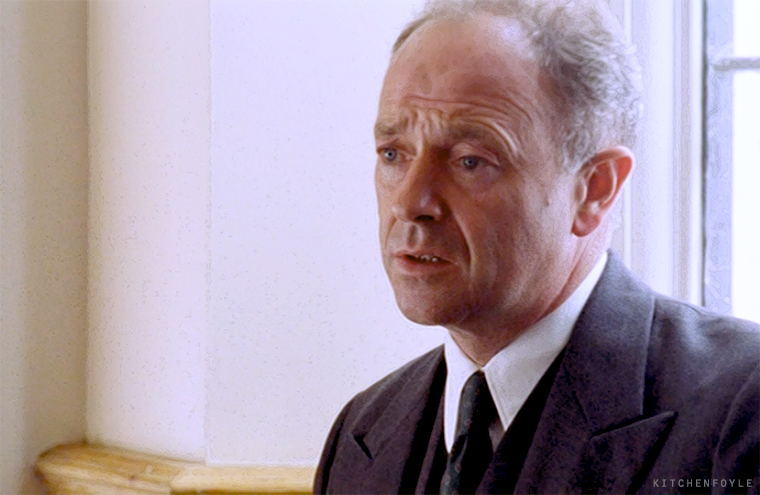 But as Michael Kitchen’s anguished eyes indicate, Foyle takes little pleasure in eventually arresting a man driven to extreme measures by a life-shattering event. 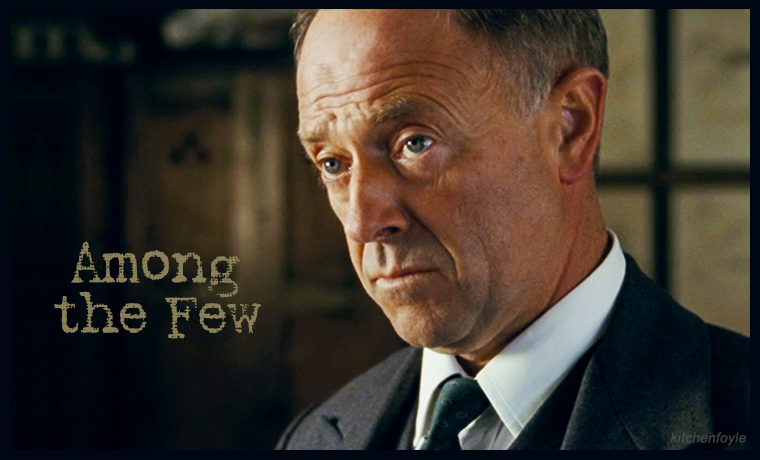 Michael Kitchen blinking his incomparable eyes. His half blink is enough to cause one to cave as well. Foyle’s famous tree climbing stunt. That would have been a sight to see! 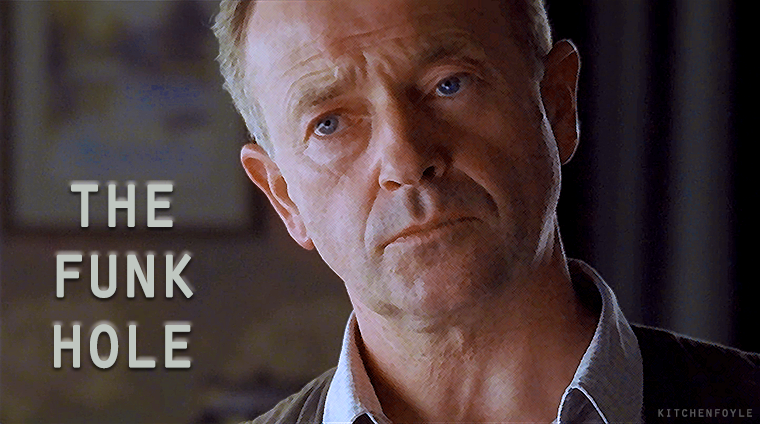 （＾ｖ＾） Clearly, Michael Kitchen possesses extra facial muscles. A casually dressed Foyle appears at the door of his home during his forced leave of absence for the trumped-up charge of “seditious behavior in an air raid shelter”. Loyal Sgt. Milner has stopped by to pass on some confidential documents that may help his boss. An invitation to tea out of the blue. Andrew is suspicious. …only to have things turn sour when Andrew sees through the ruse. just as in their first meeting. Only because your dad cares about your well-being, Andrew. All the while, Sam tries to defend Foyle’s actions. Technically no Foyle/MK here, but he is the subject of the conversation. I’m glad Andrew redeems himself in the eyes of Sam by the end of the episode. Having churlishly and thoughtlessly dismissed Sam, Andrew is on the receiving end of a harsh scolding from Foyle, who’s not in the best of moods after having been suspended from duty on a false charge of sedition. Openly angry Foyle is a sight to behold.